My last few posts have been social media audits. Each one assessed a single online channel of a well-known startup. While trying to figure out what brand to feature next, I considered Nasty Gal. The only problem being, Nasty Gal is killing it on Instagram. Of course there’s always room for improvement, but with no major shortcomings I wondered if I should keep looking. When a brand is doing well, I think it takes skill to point out its weaknesses. More importantly, I was hoping my actionable advice was heard and helped the startups improve their online presence. After following Nasty Gal’s Instagram account for a couple of days, I realized that even though they don’t need my unsolicited advice, other brands are bound to be inspired by their success. I often get asked if Instagram is worth it. This depends if your customers are even using the social network. You should also know that Instagram may not drive much traffic (and in turn sales) overnight, but it’s invaluable for building a loyal community. This is partly due to the Instagram feed being one of the few that is still viewed in its entirety by many users. 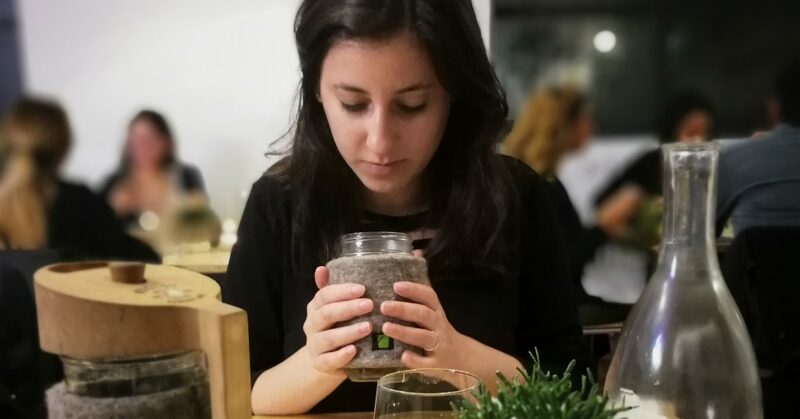 Below are some actionable lessons that translate to most consumer brands, and will help you tap into Instagram’s captive audience. Open NastyGal.com in a new tab, and soak up that feeling. Now open up another tab with the Nasty Gal Instagram account. The brand has managed to duplicate the experience, with Nasty Gal’s Instagram being as vibrant as their site, and full of attitude. The risqué tag line appears on their Twitter account, though it slightly differs from their Pinterest and Facebook bios. This might be intentional, as you should always keep in mind the type of users on each social network. However, your target audience might not change much depending on the medium. Consistent messaging can help with SEO and with conveying a stronger and more memorable image. The only hyperlink on Instagram is the one in your bio, so be sure to use that space wisely. Nasty Gal links to their homepage. You can follow suit, or be creative and link to a landing page personalized for Instagram followers. The Nasty Gal logo is used as a display picture for the main account, while a slightly revised image appears on their careers account. You might be tempted to switch up your display picture, but exhibiting a consistent logo helps improve brand recognition. Sophia Amoruso is no stranger to social recruiting, and having a separate careers account allows Nasty Gal to stay true to their brand. If you plan on sourcing talent and distributing open positions on Instagram, consider that the content that appeals to your customers might differ from what you’d like to share with potential hires. The majority of Instagram users capture moments as they occur, but creating appealing content that represents the Nasty Gal brand sometimes means carefully stylized product shots and Photoshop fun. These custom images do well since they don’t go as far as pushing generic marketing messages or shooting merchandise on boring mannequins. Even when a product shot features a model against a white background, she is fully accessorized and looks like she stepped out of a glossy fashion magazine, rather than a dimly lit warehouse. You want your brand to stand out in the feed, not look out of place. 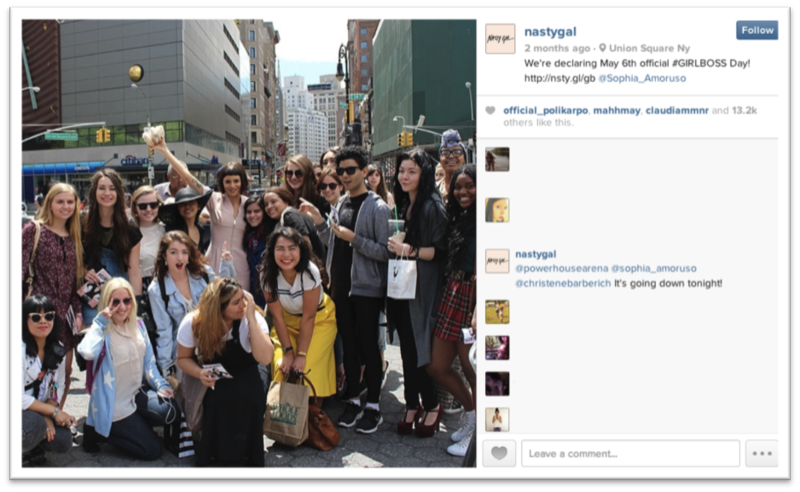 Nasty Gal takes full advantage of Instagram’s video feature by announcing contest winners and sharing GIFs. Recently, Nasty Gal created a very short and funny ad for a new app. Understanding the sense of humour of your audience, can help you create entertaining videos that don’t offend your followers. Nasty Gal has also been promoting Sophia Amoruso’s new book #GIRLBOSS by portraying successful women. These insightful videos are well received, as they provide followers with valuable advice and inspiration. Aside from sharing the classic Nasty Gal look, new fashion and internet trends are also incorporated into images. This goes further than acknowledging seasons and holidays. These images make Nasty Gal part of the conversation, if not an authority, on festival wear and even wildly used emoji. Nasty Gal also understands which famous personalities resonate with their audience. Photos of them wearing the clothing brand are posted along with a custom url. Followers can then learn more the product showcased, and other favourite Nasty Gal picks. The custom url is added both in the caption and as a ‘location’. Neither of these links are clickable, so you will likely see very little traffic if they are only used on Instagram. If you do decide to include links, always use a custom url. This way you’ll be able to test variables and improve your results. 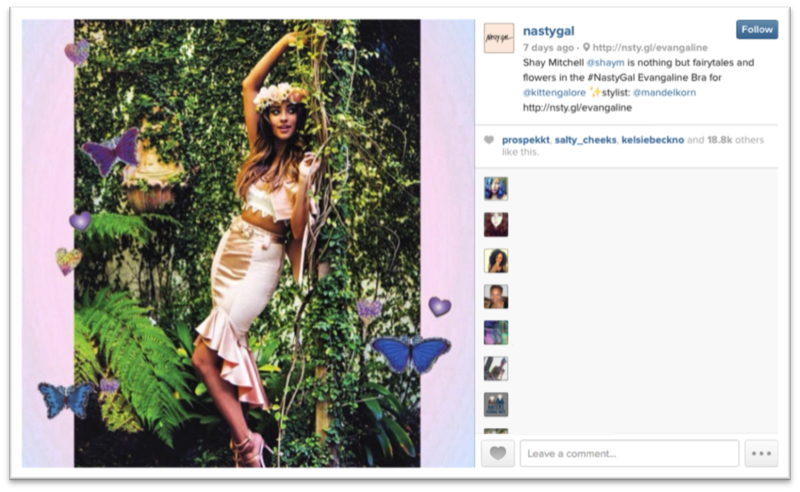 Nasty Gal’s loyal community, solid call-to-actions, and striking images are all factors contributing to increased visits as users type out the url or copy and paste the caption. While Nasty Gal mostly includes a url in place of a location, they do sometimes include a physical location. Adding a place increases your reach to Instagram users browsing images at that location. There have been some issues with location since Instagram replaced Foursquare with Facebook Places, so be sure to pick an accurate address. Regardless of where the shot was taken, if the people in the photo have an Instagram account, Nasty Gal @mentions them within the caption. This makes it easy for your followers to engage with that person. Instagram also allows you to tag people in the photo itself, but you might want to get permission first since tagged photos will appear publicly in their profile. Either way, the person will get notified which encourages more activity and hopefully a repost of the photo for their own followers. Adding hashtags to the caption can also increases likes, comments, and followers. Hashtags improve engagement by targeting users that aren’t yet following your brand. 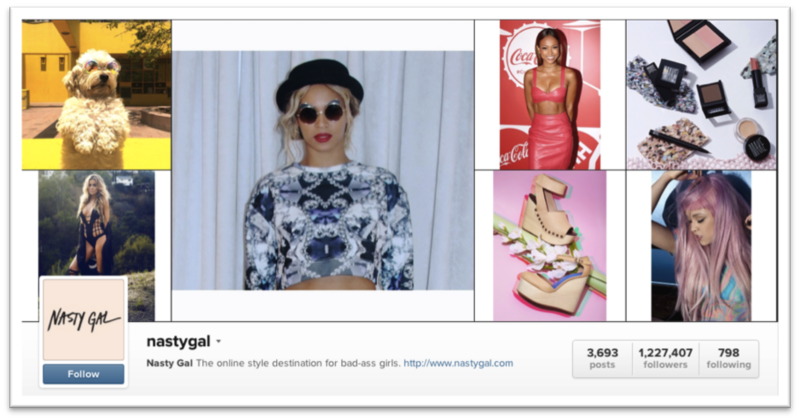 Nasty Gal could include popular, yet relevant, hashtags such as Fashion (114M+), Style (87M+), and Vintage (12M+). However, they mostly use their own branded hashtags. Event though these have been gaining momentum, the branded hashtags are likely to only be used by current followers. A balance of the two can have a significant impact on your brand awareness and engagement metrics. Creating your own hashtags can help you build a community around a shared love for your brand. However, the above only works if that sentiment already existed among your customers. Nasty Gal was able to build a large audience, because it offers high quality products that their customers desire. Nasty Gal has 1.2M+ Instagram followers, hundreds of comments per photo, thousands of images with their branded hashtags, and yet they still take the time to interact with fans. Initially this will be easy to do, but as your online presence grows you will have to make an effort to ensure engagement remains a priority. Nasty Gal knows the value of listening to customers on social media, and this has helped them become a stronger brand with a growing loyal community. I’m about halfway through reading #GirlBoss and I’m really impressed with the empire that Sophia Amoruso has built. Her honestly, hard work, and dedication definitely shows throughout her entire brand, especially her Instagram account. Love it!